At Newtown’s Sandy Hook Elementary School, authorities say, a gunman identified by federal law enforcement officials as 20-year-old Adam Lanza fatally wounded 20 children — some as young as 5, according to the president — and six adults. One other person was injured. Lanza was found dead at the scene. It ranks as the worst such attack at an elementary, middle or high school in the nation’s history, horribly surpassing the 13 people killed by two students at Colorado’s Columbine High School in 1999. The incident began around 9:30 a.m. ET. Sandy Hook is a K-4 school. According to state records, there are about 670 students enrolled there. 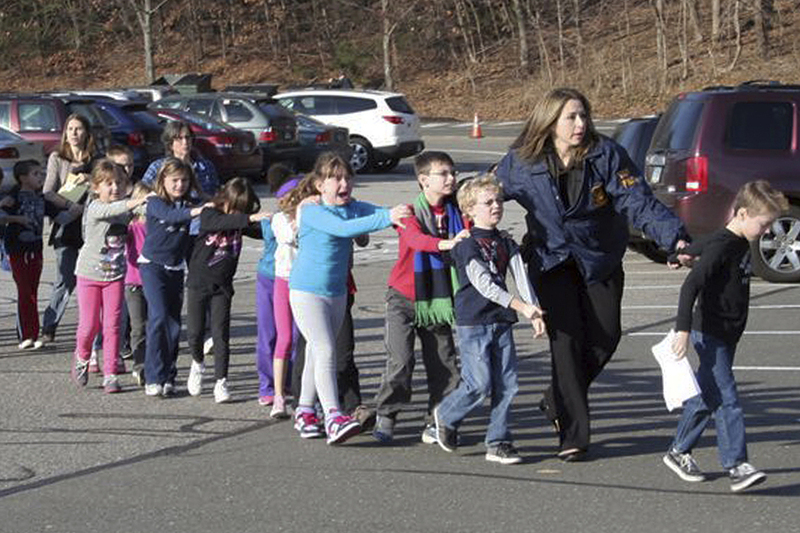 Eighteen children were pronounced dead at the school and two more died after being taken to a hospital, Connecticut State Police Lt. J. Paul Vance just told reporters. Six adults, he said were found dead at the scene. The gunman, who he did not identify, was also found dead. Vance also confirmed that another adult who is connected to this tragedy in some way was found dead today. It’s been reported that person may be the gunman’s father. Flags at the Capitol have been lowered to half staff. “Police cars and multiple press agencies are presently swarming a location at 13th and Grand streets in Hoboken,” the Hudson Reporter writes. It’s been reported, as the newspaper adds, that the father of the suspect in the Connecticut rampage may have been killed in Hoboken earlier today. The White House says the president will address the nation at 3:15 p.m. ET. Update at 2:45 p.m. ET. Law Enforcement Source: Gunman’s Name Is Ryan Lanza. A law enforcement source in position to know tells NPR’s Carrie Johnson that the gunman’s name was Ryan Lanza. That’s what other news outlets were told earlier. The source also says one of the weapons found at the scene was a .223 caliber rifle. Update at 2:30 p.m. ET. From The New York Times: Gunman’s Mother Was A Teacher At The School. “Law enforcement official says gunman at Ct. school killed mother, who was teacher, then killed 18 children in class,” tweets Times Deputy Metro Editor Clifford Levy. NBC News is reporting that a body found in New Jersey is that of the suspect’s father. Neither of those reports has been independently confirmed by NPR. We are beginning to see reports, citing unnamed sources, about who the gunman was. NPR, however, has not yet heard from anyone in authority who the shooter was. Update at 2:25 p.m. ET. “We Were Told To Hold Each Others’ Hands And Close Our Eyes,” Child Says About Evacuation. “There were several fatalities at the scene, both students and staff,” Connecticut State Police Lt. J. Paul Vance just told reporters. He said he would not give specifics, pending notification of the victims’ families. According to Vance, 911 calls started coming into Newtown police around 9:30 a.m. The local police contacted state authorities, who responded to the scene. Officers “immediately entered the school,” Vance said, and started both searching for the shooter and evacuating the students and staff. 11:20 a.m. ET: There was a shooting at an elementary school in Newtown, Conn., this morning, but as is often the case in the early minutes and hours after such a tragedy it is not clear what has happened. We will update when more solid information comes in about the situation at Sandy Hook Elementary School. WSHU reporter Craig Lemoult has also just arrived at the scene. John Murphy, a spokesman at Danbury Hospital, just told reporters that there are three patients at the hospital with injuries suffered during the incident. He also said it’s his understanding that police will be briefing at 1 p.m. ET. Authorities are now expected to brief the news media shortly. Connecticut State Police are expected to hold a news briefing at 1 p.m. ET.